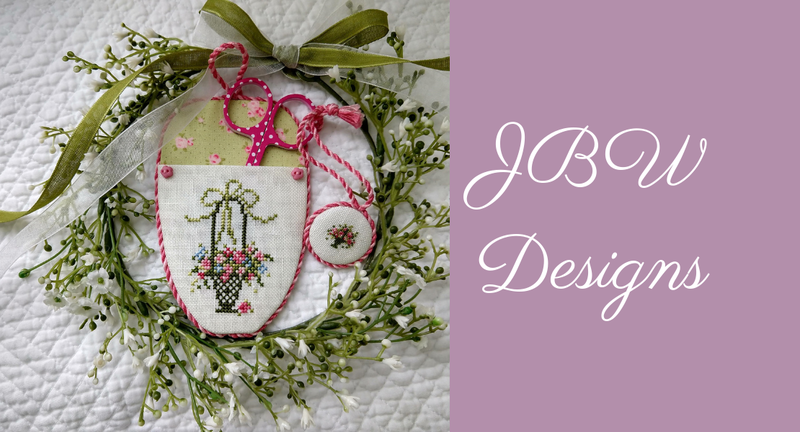 JBW Designs: Fall 2015 New Releases! Worked on #32 Belfast linen in soft ivory using Weeks and Sampler Threads. Worked on #32 French Polka Dot linen using Classic Colorworks fibers. Two models are pictured: the first one finished with a pulled thread edging and made into a sweet little bag, and the second model stitched over one has been mounted on a red hornbook exclusively available from Kelmscott Designs. La Pere Noel is part of the French Country line. The design has been worked on #32 Belfast cream linen using Classic Colorworks fibers. Two models are pictured: one over two threads finished as a pillow with red rick rack edging, and the second model stitched over one, finished as a tiny pillow (about 5" square). The design was stitched on a soft ivory #32 Belfast linen using Classic Colorworks and Weeks fibers. This particular design was adapted from an antique sampler which I purchased about a year ago, dated 1879. The motifs were just fascinating, and the quotation reads: "May peace be your gift at Christmas and your blessing all year through." Two models were stitched and finished as little treat bags. I chose #32 Belfast linen in light sand for the model over two threads, and #30 Northern Cross linen for the over over one model. Classic Colorworks and Weeks were used for the fibers. Worked on #32 Polka Dot linen (over two model) or #30 Northern Cross Linen (over one model) using both Weeks and Classic Colorworks fibers. Kit includes: #32 Belfast linen, charms, needle, chart and finishing instructions. Kit includes: #32 Cream Belfast linen, rick rack, buttons, fabric lining, ribbon, needle, chart and finishing instructions.